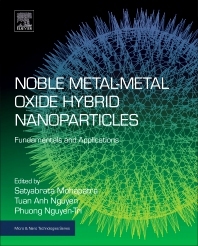 Noble Metal-Metal Oxide Hybrid Nanoparticles: Fundamentals and Applications sets out concepts and emerging applications of hybrid nanoparticles in biomedicine, antibacterial, energy storage and electronics. The hybridization of noble metals (Gold, Silver, Palladium and Platinum) with metal-oxide nanoparticles exhibits superior features when compared to individual nanoparticles. In some cases, metal oxides act as semiconductors, such as nano zinc oxide or titanium oxide nanoparticles, where their hybridization with silver nanoparticles, enhanced significantly their photocatalytic efficiency. The book highlights how such nanomaterials are used for practical applications. Nguyen is Head of the Microanalysis Department, Institute for Tropical Technology, Vietnam Academy of Science and Technology, Vietnam. His research focuses on advanced nanomaterials, and nanotechnology for corrosion and materials integrity in transportation systems.